Currencies are not interchangeable at point of purchase. Cuban pesos are not accepted in tourist facilities and dollars cannot be used in ration stores. Dollars and pesos, however, may be exchanged before the sale. For purposes of this paper, food that can be purchased only with U.S. dollars, Cuba’s convertible peso or euros is referred to as “dollar food.” The thesis of the paper is that the hard currency cost of Cuba’s imported food is offset by sales in Cuba of food for dollars. That is, the amount of dollars spent by Cubans and foreign visitors in Cuba for food at the consumer level is equal to, or greater than, the amount of dollars spent by the government to import food. There are two general categories of food markets in Cuba, the peso food market and the dollar food market. 2 Peso food markets are not meant to compete with food being sold in dollar stores; however, the same or similar products may be available in both markets. Of Cuba’s official food markets, only the dollar stores (tiendas en divisas, also referred to as TRDs—tiendas de recuperacion de divisas and “la chopin”) trade in dollars. Cubans who do not have dollars, or adequate pesos to exchange for convertible pesos, do not participate in the government’s dollar food market. Reportedly, this applies to about one-third of the population. Another one-third has access to dollars from time to time. The remaining one-third has access to dollars on a continuing basis. Those Cubans living in Havana, about 20% of the 11.2 million, account for the highest percentage of the people with access to dollars. There are three major sources for Cuban consumers to gain access to dollars: remittances, tourism and foreign businesses. Cuban nationals obtain dollars primarily through remittances, funds sent to them by family members living abroad. While the flow of remittances to Cuba is less than to many other Latin American or Caribbean countries, the amount is growing. Data from the Inter-American Bank show a 22% increase in 2002. Dollars sent to family members by the one million Cubans in the United States, and the thousands living in other countries, totaled $1.138 billion in 2002. Cuba’s purchasing and distribution system supplying the dollar food market is decentralized and complex. It is an intricate network of organizations authorized to purchase from domestic production and importation, and distribute food products in Cuba for dollars and/or pesos. Organizations include government agencies, state-owned companies, mixed enterprises, associated foreign firms and licensed private restaurants. • the underground (black) market. Dollar foods purchased and sold in Cuba are both produced domestically and imported. The government’s priority for supplying the dollar food market is to buy and sell fresh produce, processed foods and other food products that are of national origin. The second priority is to purchase production from mixed enterprises. When products are not available through national production or from mixed enterprises, the government will import products to supply the dollar food market. Much of the food imported from the United States, Canada and the European Union is sold in Cuba for dollars. In addition, some fresh produce and manufactured foods originating in Cuba earn hard currency through sales in Cuba’s dollar stores, the tourist industry and via other market outlets. State production units include state farms, state-controlled agricultural cooperatives, and national food manufacturers. State farms and the Basic Units of Cooperative Production (UBPC) are the main national sources of fresh produce for the dollar market. They operate under the authority of the Ministry of Agriculture (Ministerio de Agricultura—MINAGRI). Processed products of national origin are provided by manufacturers operating under the jurisdiction of the Ministry of Food Industries (Ministerio de la Industria Alimenticia—MINAL). Fresh Produce: Fresh fruit and vegetables of national origin are supplied by state-owned companies such as Frutas Selectas S.A. This semi-autonomous company, within the Ministry of Agriculture, selects the best fruits and vegetables produced by state-owned farms and state-controlled cooperatives. Frutas Selectas then markets the products to tourist hotels and restaurants. Several other companies, under the jurisdiction of the Ministry of Agriculture, supply food and agricultural products for sale to the tourist trade. Companies include: Cítricos Ceiba, Cítricos Ciego de Avila, Cítricos Caribe, CAN, La Cuba, Apicultura, Empresas Porcino, Empresa de Tabacos y Cigarros, Hortícolas, OROCA, CAI Arrocero, Empresas Pecuarias, Cuba Café and Suministros Agropecuarios. Processed Foods: All food manufacturers in Cuba are under the jurisdiction of the Ministry of Food Industries, created in 1965. MINAL oversees industries manufacturing milk and meat products, cereals, confections, bread, biscuits and crackers, pastries, fruit and vegetable products, alcoholic beverages, water, soft drinks, beer and other products. Industries milling bulk commodities, such as wheat and rice, also are under the jurisdiction of MINAL. International assistance from 1975 to 1990 for research and development in Cuba’s food industry led to substantial growth in food manufacturing. Production increases during this period included: canned meats, 157%; canned fruits and vegetables, 66%; cheeses, 143%; and wheat flour, 126%. The number of production lines had grown from 57 in 1975 to more than one thousand by 1989. With the loss of Soviet and Eastern Bloc trade preferences in 1989 and 1990, there was a progressive decline in Cuban production in general until the mid- 1990s. Food industry executives were forced to introduce products that made it possible to raise production volumes through increased use of extenders and substitutes in products destined for the domestic market. The imperative was to maintain nutritional values despite a reduction in agricultural production, especially of meat products. Production lines that are growing the most include: beer, soft drinks, mineral water, alcoholic beverages for export, powdered milk, pastas, flour, soft cheese, ice cream, and yogurt. Wheat flour production also showed some increase, while milled rice production decreased substantially. A mixed enterprise generating dollar sales of food products may include a food manufacturer or an agricultural production unit. Enterprises producing dollar foods may take the form of a joint-venture investment, an international economic association, or a cooperative production agreement. There are no totally foreign owned food production or manufacturing operations in Cuba. Mixed enterprises, the second highest priority, include foreign-associated companies such as Sherritt Green. The joint venture company, formed with Sherritt International of Canada, produces fruit and vegetables for sale to tourist hotels and restaurants. Mixed enterprises producing for the tourist trade, in addition to Sherritt Green, include Agro King of Canada, Grupo BM of Israel, and others. Sixteen of Cuba’s food-manufacturing companies are joint ventures and 12 are Cooperative Production Agreements.9 Each of the 16 mixed enterprises are associated with Coralsa (La Corporacion Alimentaria— CORAL S.A.), a holding company constituted within MINAL in 1996. The Ministry restructured in the mid-1990s to promote increased support for food industry firms operating with foreign capital. Participation of Coralsa in the 16 enterprises ranges from 40% to 50%. Fixed assets of the companies at the time of restructuring were placed at $36 million. They had $4 million in working capital and $25.5 million in the process of investment. Another area of activity in the Cuban food industries sector has been the overseas food processing operations in which there is Cuban capital and technology. A portion of the earnings from these industries is returned to Cuba. Cía. de Tasajo de Uruguay, for example, was established in Uruguay to process jerked beef and other meat products for export to Cuba and other Latin American and African countries. A Coralsaowned company, Carnes del Mercosur S.A., located in Cuba, imports and markets the products in Cuba for the internal market. Historically, before and after the revolution, imported food has been an important factor in feeding Cuba’s population. During the years of favored trade with the Soviet Union and the Eastern Bloc countries, Cuba had the financial means to continue importing many of the bulk and U.S. branded food items that its consumers preferred. With the loss of Soviet aid beginning in the 1990s, food imports declined significantly in dollar value but increased dramatically as a percent of total imports. In 1990 food and beverage imports were 11% of total imports. In the early1990s those imports increased to 20% or more and did not recede until economic reforms were initiated in the middle 1990s. During the past three years, a decade after the loss of Soviet support, food imports have averaged about 16% of total imports. The higher percentage at the beginning of the 1990s was a result of a reduction in total imports and a continuing need for Cuba to import food to feed its people. The lower percentage at the beginning of this century is a result of the government’s effort to increase food production and to feed its population with lower-value imported food products (see Table 1). Foods sold or made available direct to consumers and the tourist industry for dollars, generally, include those products that can be classified as consumer-oriented, but may also include intermediate products. Most bulk products require processing. Grains are an example of bulk products. Processed products, such as flour and vegetable oils, are an example of intermediate products, and meats and poultry products are examples of consumer-oriented foods. Food and Beverage Importers: Decentralization in Cuban foreign trade started in 1992, allowing state and private enterprises, joint ventures and international economic associations, direct access to external markets. Since then, the number of foreign businessmen opening branch offices in Cuba or represented by agents has increased. Many warehouses were established and duty free zones and industrial parks were opened. Authorizations increased for companies to import food, for example 30 companies are currently authorized to import meat (see Table 2). Meat and other consumer-oriented foods may be imported through several different agencies and companies. Most intermediate products and bulk commodities are imported through Alimport (Empresa Cubana Importadora de Alimentos, under the auspices of the Ministerio del Comercio Exterior). Consumeroriented foods also may be imported by Alimport to supply the peso market, such as ration stores, school lunch programs, hospitals and other institutions. Alimport also imports food ingredients for the food industry sector. In addition, dollar stores and other government-owned companies may receive food products imported by Alimport. For FAS and FOB operations, Alimport relies on a logistics group in charge of chartering vessels and monitoring the entire process of transportation from the operational standpoint. Alimport works with Cuban flag vessels, brokers, or directly with foreign flagship owners, and agrees on terms and operates with them as per international practice standards. Other official importing agencies of dollar foods include government-owned holding companies that supply retail dollar stores and government-owned companies and mixed enterprises that own or operate tourist facilities. Food and Beverage Imports: Food and beverage imports, in terms of total value, are currently at the level of the beginning of the 1990s. Food imports in 1990 were $827 million and beverage imports totaled $4 million. In 2001 food imports were valued at $754 and beverage imports at $16 million. Wine at $5.7 million in 2001 accounted for 35% of the beverage imports. From 1991 to 1995 wine imports were negligible. Increased wine imports since 1995 reflect the government’s emphasis on tourism, which has become the driving force of the economy. Tourism also requires importation of higher value foods. With the return of tourism forecast, Cuba may increase the value of food and beverage imports in 2003 over the $832 million estimated for 2002. There are two principal marketing outlets for food sold for dollars in Cuba. They are the dollar stores and the tourist trade. Other entities involved in the dollar food chain include in-home family restaurants known generally as paladares14 and the underground or black market. The importance of the black market, which deals in both pesos and dollars, has fluctuated with the availability of food through official channels and economic reforms and regulations imposed by the government. Impact of paladares on the dollar food market, however, may be of greater proportional importance than for the total economy. In addition to purchasing food for dollars at retail dollar stores, paladares owners may exchange dollars for pesos at CADECAs in order to purchase food in the peso agricultural markets. Retail stores selling food and beverage products for dollars are scattered throughout the country. Dollar stores are owned by the Cuban government. No foreign investment in these stores has been permitted. In all of these retail stores, food products that have been imported or produced domestically are sold for dollars. In Havana there are approximately 300 dollar stores, and in the entire country roughly 1,000. Most of the dollar stores outside Havana are located in the tourist areas of Varadero and Jardines del Rey, Norte de Camagüey, Norte de Holguín, Santiago de Cuba, Costa Sur and Archipiélago de los Canarraeos. Names of the major dollar store chains and the government corporations owning them include: 1) Tiendas Panamericanas (CIMEX S.A.), (2) Tiendas Universo (Cubanacán S.A.), (3) Tiendas Caracol (Caracol S.A.), (4) Tiendas Meridiano (CUBALSE S.A.), (5) Tiendas TRD Caribe (Caribe S.A.), and (6) Tiendas Habaguanex (Habaguanex S.A.). Purchases and Sales of Dollar Stores: Based on data obtained pertaining to some of the dollar store purchases, it is estimated by the authors that approximately 40% to 60% of the value of food products purchased for sale in dollar stores are imported. Remaining needed supplies are provided from national production. Prices of products sold in the dollar stores are normally higher than those offered in other internal food markets. The consumer may pay a price that is 200% or more above the imported price or the price in one of the internal food markets.17 Products similar to those available in the dollar stores may be found at lower prices in other internal markets. Dollar stores, reportedly, sell imported products at 240% of cost, and products of national origin at 170%. Cuba rates its hotels on a star basis, ranging from one to five stars. A five-star hotel is better than a fourstar, etc. The rating system does not compare facilities and services to comparable stars of hotels in other countries, but is used only to compare quality of hotels within Cuba. With current standards, most international tourism and the resulting market for dollar foods, is concentrated in three, four and five-star hotels. While two-star and one-star hotels provide a limited market for imported dollar food products, the major source of food for these hotels is the domestic market. Cuba has approximately 300 tourist properties with about 40,000 rooms. Five-star and four-star hotels account for approximately 40% of the hotels and 70% of room occupancy. Three-star hotels account for about 35% of the hotels and one-fifth of the rooms, while two star-hotels account for 25% of the hotels and 10% of room occupancy. Annual growth in tourism in the 1990s was more than 15%, but in 2001 the number of tourists was only slightly more than the year before, approximately 1.8 million. A slow start for tourism in 2002 resulted in even fewer tourists, 1.7 million, than recorded each of the previous two years. Holding Companies Serving Tourism: Several semi-autonomous holding companies service the tourist industry. They include: Corporación Cubanacán, Grupo Hotelero Gran Caribe, Horizontes Hoteles, Habaguanex, Grupo de Turismo Gaviota, Isla Azul, Grupo de Recreación y Turismo Rumbos, Compañía de Marinas Puerto Sol, and the Complejo de Convenciones. Some description of each company is given in Box 1. To some extent, all of the companies compete with each other, but they concentrate on different segments of the tourist market. No foreign investment has been introduced in the ownership of these companies. A few foreign companies have negotiated contract agreements that permit them to import food directly for their tourist facilities. Foreign companies having arrangements under Foreign Investment Law No. 77 with the Cuban companies often operate as hotel administrators and assume responsibility for food and beverage services. Some have taken equity positions in the hotels owned by the holding companies. These include, among others: Grupo Sol Meliá and Hoteles C from Spain; Accor and Club Med from France; LTI and RIU from Germany; Delta Hotels and Resorts, Commonwealth Hospitality, Ltd., and Leisure Canada, Inc. from Canada; Viaggi di Ventaglio and Press Tours from Italy; and SuperClubs from Jamaica. About 30% of Cuba’s hotels involve investments with foreign companies. There are no totally foreign owned hotels in Cuba. Principal Supplier for Tourism: Comercializadora ITH, S.A. is the principal company importing supplies for tourist hotels and restaurants. ITH operates under the auspices of the Ministry of Tourism (Ministerio del Turismo—MINTUR) importing products for government-owned tourism holding companies, mixed enterprises, and individual hotels and restaurants. It is the only company supplying food and other items for tourist facilities throughout the country. Food products may be imported directly by ITH, or it may import through Alimport, or any of the official importing agencies. Products are purchased by ITH from both domestic and foreign sources. Food Purchases, Sales and Tourism Revenue: Gross revenues from tourism in 2002 from 1.7 million tourists totaled $1.5 billion, with $350 million in gross profits. Cuba has projected 3.1 million visitors in 2005, and revenue from tourism at $2.5 billion. For 2010, Cuba has projected 6.2 million visitors and $10 billion in revenue. In view of factors affecting tourism in Cuba and worldwide, it is doubtful theses figures will be achieved. Increased tourism of this magnitude obviously would affect the demand for food, both from domestic production and imported. The proportional increase would probably favor imported food. Increased demand for imported food would impact the need for additional hard currency. With the high markup policy on food sold through tourist hotels and restaurants, however, the country may advance the foreign currency needed to import the food needed for tourism. Food is sold through tourist hotels and restaurants, generally, at 300% of the imported dollar cost. As in dollar stores, food of national origin transacted through tourism is sold at a lower price markup. Cubanacán S.A. accounts for a large percentage of the tourist market. 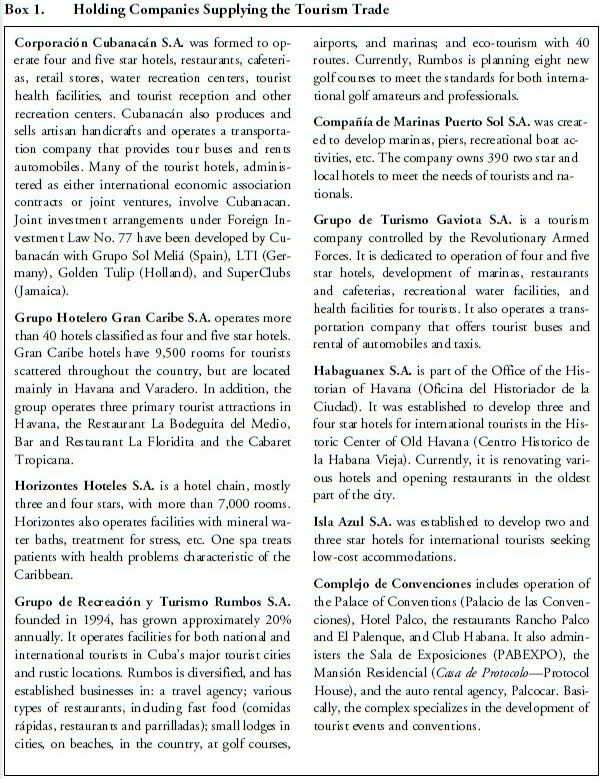 It is comprised of 15 companies registered in Cuba, including Cubanacán Hoteles administering 28 hotels. Other Cubanacán companies include Palmares Restaurantes, operating 50 restaurants and numerous cafeterias. Tiendas Universo owns a network of commercial centers and stores catering to the tourist trade. Cubanacán, and the mixed enterprises in which Cubanacan maintains interest, represent 34% of Cuba’s tourism receipts. Complete data are not available to the authors stating the value of food, imported or produced domestically, sold for dollars through dollar stores or tourism. Estimates of the value of food distributed through dollar stores and the tourist industry are made based on both official and unofficial sources (see Table 3). Domestic supplies of dollar food originate with the Ministry of Agriculture, the Ministry of Food Industries and mixed enterprises. Food production, mostly fresh produce, sold through the Ministry of Agriculture to the tourist sector and dollar stores in 2001 totaled $168 million, an increase of 3.5% compared to gross revenues of US$162 million reported in 2000.20 In 1998 and 1999, MINAGRI reported gross revenues from marketing agricultural commodities to the tourism sector of US$59 million and US$70 million, respectively. Information is not available to explain the large increase from $70 million in 1999 to $162 million in 2000. Assuming the higher level of food supply will continue to be available for sale to the tourist industry; however, an estimated value of food produced under the auspices of the Ministry of Agriculture and sold for dollars through tourism could range from $160 million to $180 million in 2003. Sales of processed food for the tourist sector and dollar stores in 1998 totaled $171 million, 21% more than the year before. Production was three times greater than in 1994, when the food processing industry began focusing on the dollar market. Approximately 15% of total output of the food processing industry were destined for the tourist trade and export. By 1999, the dollar market represented 20% of production sales. Processed foods sold through the Ministry of Food Industries to the tourist sector and dollar stores, assuming most of the mixed enterprise production and some of the national company production enter the dollar market, could range from $150 million to $180 million. Data are not available on the value of food produced in Cuba, largely fresh fruit and vegetables, for the tourist market by mixed enterprises, but could range from $5 million to $10 million. The European Union and Canada in the 1990s provided about half of Cuba’s food imports, while Mexico, and Latin American (Argentina and Brazil for soybean products) and Asian countries (China, Thailand and Vietnam for rice imports) were also important sources of food imports. More than half of Europe’s agricultural exports to Cuba, which totaled $185 million in 1999, consisted of wheat flour, vegetable oils and consumer-ready products, primarily dairy products and poultry meat. Wheat accounted for about 45% of the total. Canada’s agricultural exports to Cuba, $115 million in 1999, were largely (83%) pulses and consumer-oriented products, such as red meat, poultry and dairy products. Official data show food and beverage imports in recent years ranging from $700 million to $800 million. Approximately half of the food imported by Cuba meets the classifications of intermediate and consumer-ready products. The remaining half consists of bulk commodities, such as wheat, coarse grains, soybeans, pulses, and rice. Most of the bulk and some of the intermediate products imported by Alimport are for the accounts of the ration stores, institutions and food manufacturing companies. A large percentage of the imported food products classified as intermediate and consumer-oriented, is sold direct to consumers through dollar stores, government- owned restaurants, and tourist hotel cafeterias and restaurants. With changes in U.S. policy regarding food and agricultural exports to Cuba and Cuba’s reduced food supply as a result of tropical storms, food imports from the United States have been initiated in the new century. In the year 2001, the United States exported $4.6 million in food to Cuba. 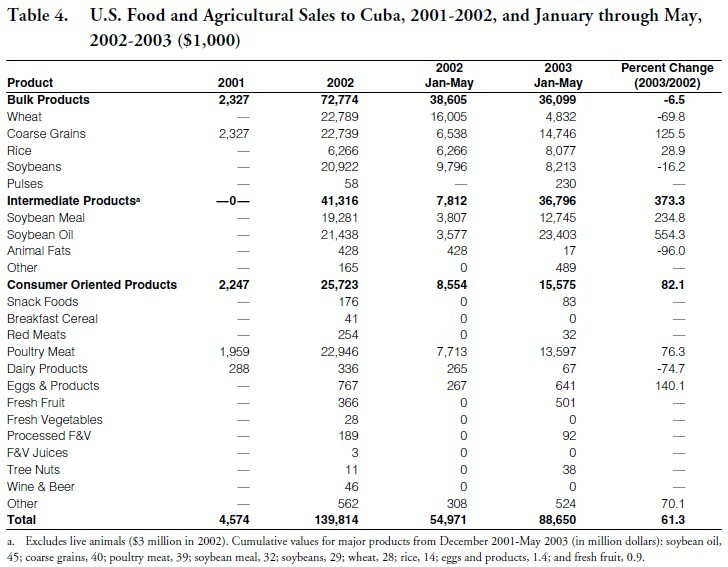 In 2002, U.S. food exports to Cuba increased to $140 million (see Table 4). The Cuban government has designated Alimport as the sole importer of food and agricultural products from the United States. Dollar store and tourism holding companies must obtain authorization from Alimport before importing food from the United States. This procedure is not required for other countries. In 1996 the Cuban Liberty and Democratic Solidarity Act (the “Helms-Burton Act”) further tightened the embargo. Although trade between Cuba and U.S. foreign-based subsidiaries was not legal, according to U.S. law, food products with popular U.S. brands continued to be available in Cuba throughout the 1990s. It was not until January 1999, when President Clinton announced substantial changes in U.S. commercial policy toward Cuba, before prospects improved for food and agricultural exports to Cuba. The Executive Order President Clinton signed in 1999, although interpretation was questionable, permitted U.S. food sales in Cuba to small private farmers, private cooperatives, individual Cuban nationals, private home-based restaurants, non-government organizations (NGOs), and the government-formed Basic Units of Cooperative Production (UBPCs). Although these private sales opportunities were permitted, there were no significant sales of food to Cuba until 2001. In fact, there were no significant sales of U.S. food and agricultural products to Cuba for more than 40 years, from 1960 to 2001. More recent action, the Trade Sanctions Reform and Export Enhancement Act (TSRA), was signed into law late in 2000. It was not until July 12, 2001, however, that the implementing regulations were published. One of the primary purposes of TSRA was to require the U.S. Government to license commercial sales of agricultural commodities to purchasers in Cuba. All sales by U.S. companies would be authorized only in U.S. dollars—no credit transactions would be permitted. Initially, Cuba cast aside offers of U.S. food products, including donations for disaster assistance. Following Hurricane Michelle in November 2001, however, Cuba’s food reserve was depleted and Cuba turned to the United States for food, especially bulk commodities, such as wheat, coarse grains, soybeans and rice, to supply food industries, ration stores and to furnish institutional food. All purchases have been for cash. Cuba has indicated it will continue a high level of food imports from the United States in 2003. Cuba seems to be doing this. During the first five months of 2003, Cuba has increased imports of U.S. food 61% over imports in 2002. Since exports of U.S. food to Cuba began in December 2001, Cuba has purchased U.S. food valued at $233 million (Table 4). U.S. bulk agricultural exports to Cuba from December 2001 through May 2003 totaled $111 million, intermediate product exports were $78 million, and consumer-oriented exports reached $44 million. Major commodity exports were: soybean oil, $45 million; coarse grains, $40 million; poultry meat, $39 million; soybean meal, $32 million; soybeans, $29 million and wheat, $28 million. With prospects for regaining a higher level of tourism, Cuba’s need for high-value food may increase. A study by the Cuba Policy Foundation22 states that expenditures of $30 per day for food by U.S. tourists would require $126 million in food imports annually by Cuba, based on 1.5 million tourists staying seven days in Cuba. Higher estimates of dollar food expenditures and larger numbers of tourists, whether from the United States or other countries, would result in higher estimates of food import needs. Combining estimates of domestic and foreign food supplies entering Cuba’s dollar food market provides a total of all foods sold in Cuba for dollars at roughly $400 million to $500 million. The value of dollar earnings from food being sold for dollars could range from $750 million to $950 million. Allowing for the cost of imported food sold in the dollar market would provide adjusted dollar earnings of $650 million to $800 million. Based on the findings, the hard currency cost of imported food appears to be offset, in general, by sales in Cuba of food for dollars. 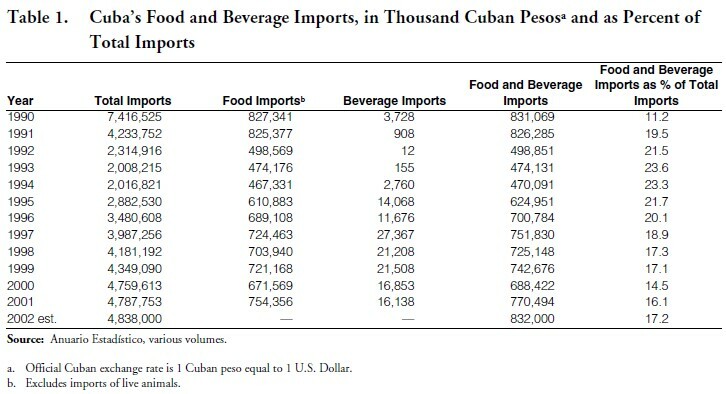 In other words, dollar earnings from sales in Cuba of imported and domestically produced food appear to be equal to or greater than the amount of foreign exchange used to import food. Estimating the dollar value of food sales at dollar stores and tourist facilities provides a check on the value of dollar food entering those outlets. Dollar store sales totaled $1.22 billion in 2001.23 If the level of sales continues in 2003 and half of the dollar store sales is for food, the value of dollar food sold would be about $600 million. Tourism in 2001 was reported at 1.8 million and in 2002 at 1.7 million. If tourism returns in 2003 to the 2001 level and each tourist stays seven days and spends $30 to $45 per day for food, the range in value of food sold would be $360 million to $540 million. Combined, dollar food sales in tourist facilities and dollar stores would total roughly $1 billion. In addition to the dollar expenditures for food sold in dollar stores and through tourist hotels and restaurants, Cubans exchange dollars for pesos to buy food at the agricultural peso food markets. CADECAs often are located at or near agricultural markets to exchange dollars for pesos. The dollars then become hard currency generated from the sale of domestic food. Growth of Cuba’s dollar food market, to a large extent, is contingent on continuation of a relatively high level of remittances, and increases in tourism and foreign investment. With elevated security concern worldwide following events on September 11, 2001 in the United States, and economic recession in Canada and Europe, growth of tourism in Cuba decreased in 2002 but has risen in the first part of 2003. Foreign investment appears to be continuing on a descending trend. With a lower rate of tourist growth and shrinkage of disposable income worldwide for tourists, as well as reduced foreign investment, Cuba’s dollar food market could be affected negatively. On the other hand, if there is sustained international economic recovery, tourism increases and Cuba implements effective growth policies, the demand in Cuba for dollar food could increase. The United States, in particular, would be in a favorable position because of its competitive prices and lower freight costs. Perhaps the greatest unknown is the future of travel restrictions for U.S. tourists to Cuba. Lifting the U.S. imposed restrictions on travel to Cuba could result in a substantial increase in the number of tourists going to Cuba. This would create an increased demand in Cuba for imported, as well as domestically produced, dollar food and beverage products. 1. Euros are being accepted in dollar stores, tourist hotels and restaurants in Varadero, but currently not in Havana or other tourist areas. 2. As used in this paper, the term “dollar food market” refers to the buying and selling in Cuba of food and beverage products, whether imported or produced domestically, for dollars. 3. For detailed information on the internal markets, including price comparisons and an explanation of why consumers buy at dollar stores when the same product can be purchased for less at other markets, see José Alvarez, “Rationed Products and Something Else: Food Availability and Distribution in 2000 Cuba,” Cuba in Transition—Volume 11 (Washington: Association for the Study of the Cuban Economy, 2001), p. 305. See also Armando Nova González, “El Mercado Interno de los Alimentos,” in Cuba—Reflexiones Sobre Su Economía, La Habana, 2002, p. 193. 4. The government of Cuba maintains a fixed exchange rate for its international dealings and a more flexible exchange rate for domestic use. Cuba’s government does not vary the value of the peso for commercial transactions regardless of any fluctuation with the value of the U.S. dollar or other currencies on the international market. Economic Eye on Cuba, U.S.-Cuba Trade and Economic Council, Inc.
5. For detailed information on main sources of hard currency and possible uses by the Cuban population, see Paolo Spadoni, “The Role of the United States in the Cuban Economy,” in this volume. 6. Business Tips on Cuba, August 1996, p. 20. 7. Business Tips on Cuba, August 1996, p. 18. 8. Anuario Estadístico de Cuba ( 2002). Capítulo VIII, Sector Industria. 9. Omar Everleny Pérez Villanueva. “La inversión extranjera directa en Cuba: Evolución y perspectiva,” Cuba—Reflexiones Sobre su Economía, La Habana, 2002 p. 90. 10. Pérez Villanueva, p. 90. 11. Caribbean Basin Agricultural Trade Office of the USDA/Foreign Agricultural Service in Miami. See recent reports on food laws and the food service sector, GAIN Reports #CU2001, 2002, and 2003. 12. Presentation by Mr. Pedro Alvarez Borrego, President of Alimport, Agricultural Sales Conference, Cancun, Mexico, Jan. 30-Feb. 2, 2002. 14. Paladar, translated means palate or taste, but the origin of the use for Cuban family restaurants is said to be taken from a Brazilian soap opera. The main character goes to the capital and establishes a chain of small restaurants called Paladares. 15. Ted Henken, “Last Resort or Bridge to the Future? Tourism and Workers in Cuba’s Second Economy,” Cuba in Transition— Volume 10 (Washington: Association for the Study of the Cuban Economy, 2000), p. 331. 16. Cuba: A Guide for Canadian Businesses. Department of Foreign Affairs and International Trade. The Canadian Trade Commissioner Service, June 1999. 17. Armando Nova González, “El Mercado Interno de los Alimentos,” in Cuba—Reflexiones Sobre Su Economía, La Habana, 2002, p. 193. 19. Caribbean Agricultural Trade Office, USDA/FAS, Miami. 20. U.S.-Cuba Trade and Economic Council, Economic Eye on Cuba, March 18, 2002. 21. On May 12, 2002, the president of Alimport reported that Alimport would be the exclusive agent in Cuba for U.S. based companies. U.S.-Cuba Trade and Economic Council, council@cubatrade.org. 22. Cuba Policy Foundation, “Estimated Agricultural Economic Impacts of Expanded U.S. Tourism to Cuba,” www.cubafoundation. org, Washington, D.C., February 2003. 23. Paolo Spadoni, “The Role of the United States in the Cuban Economy,” in this volume.